Seoul (News Agency) North Korea launched a ballistic missile from the northwestern part of the country early Sunday, the South Korean Joints Chief of Staff said. 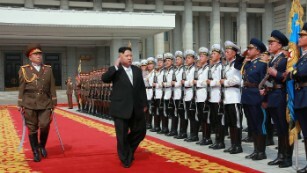 This is the first provocative move from North Korea since South Korean President Moon Jae-in took office last week. Moon has advocated dialogue with North Korea to denuclearize. The US calculated that the missile landed in water 60 miles south of Russia’s Vladivostok region, a US official told CNN. Vladivostok is home to the Russian Pacific Fleet. Moon said the missile test violates UN Security Council resolutions and called it a severe challenge to the peace and security of the Korean Peninsula and the world, presidential spokesman Yoon Young-chan said. South Korea needs to show the North that even though talks are possible, it will only be possible if North Korea changes its attitude, the President told staff at the meeting. He said South Korea will respond to provocations. 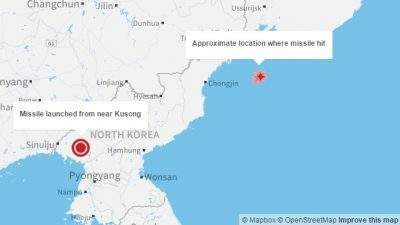 The direction of the missile, so close to Russia, was likely an attempt by North Korean leader Kim Jong Un to send a message to both Moscow and Beijing, said Carl Schuster, a Hawaii Pacific University professor and former director of operations at the US Pacific Command’s Joint Intelligence Center. “It tells Russia, ‘I can touch you too,'” Schuster said. “It tells China, ‘I don’t care what you think, I’m independent,'” he said. China remains one of North Korea’s only allies and is responsible for much of the heavily-sanctioned nation’s economy. On Sunday, Chinese leader Xi Jinping launched a major trade and infrastructure summit with multiple world leaders in Beijing. Russian President Vladimir Putin as well as a North Korean delegation attended the conference. “The timing is not coincidental,” Schuster said, adding that Kim may be trying to get Putin more involved on the situation on the Korean Peninsula. “It’s his way of telling the Russians, ‘You need to speak up,'” and stop US-supported international sanctions on North Korea, Schuster said. 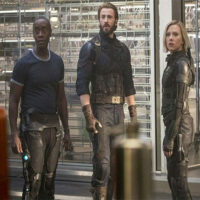 The United States called for repercussions from the international community. “With the missile impacting so close to Russian soil — in fact, closer to Russia than to Japan — the President cannot imagine that Russia is pleased,” the statement said. “Let this latest provocation serve as a call for all nations to implement far stronger sanctions against North Korea,” White House press secretary Sean Spicer said in a statement. China after the test called for restraint by all parties. “The current situation on the Korean Peninsula is complex and sensitive. 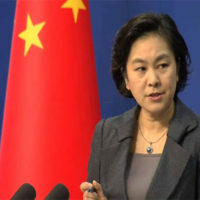 All sides should exercise restraint and refrain from taking actions that would further escalate tensions in the region,” a statement from China’s Foreign Ministry. Putin and Xi discussed the situation at the summit in Beijing, according to Russia’s state news agency, Tass. “Concern was expressed about the escalation of tension, including in connection with the launch (of the missile of the DPRK),” Kremlin spokesperson Dmitry Peskov is quoted as saying. 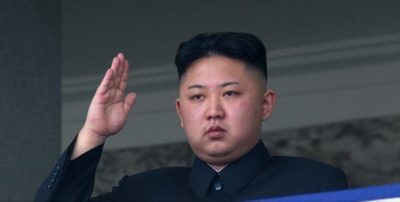 The missile, launched near the city of Kusong, flew 700 kilometers (435 miles), the South Korean military said. A US defense official confirmed that it flew that far, but said the US was still investigating to determine the type of missile. “At this point, we see nothing consistent with an (intercontinental ballistic missile) launch,” a second defense official told CNN. 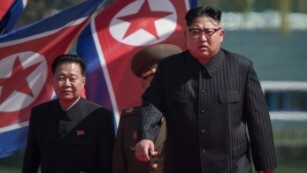 David Wright, co-director of the Union of Concerned Scientists, said North Korea may have shown off a missile with a “considerably longer range than its current missiles” with Sunday’s test. Writing on his organization’s blog, Wright pointed out that the Japan’s Ministry of Defense had the latest launch reaching an altitude of 2,000 kilometers (1,242 miles), considerably higher than would be needed for the distance the missile traveled during what was reported as a 30-minute flight time. If the missile did reach that height and fly that long, it could reach the US territory of Guam in the Pacific, Wright wrote. Japanese Prime Minister Shinzo Abe condemned the launch in a quick doorstep interview with reporters. Chief Cabinet Secretary Yasuhide Suga said the government didn’t initiate a “J alert,” a nationwide alert system for missile launches. He added that the missile didn’t come down in Japan’s exclusive economic zone, waters within 322 kilometers (200 miles) of the coast for which it has jurisdiction over resources.